Lola's menu draws on American home-style and Southern regional, gussied up with trendy international spices and flavorings and fresh seasonal vegetables. Sun-dried tomatoes are comfortable on the same menu with white anchovies, tobiko or American sturgeon, sesame seeds, red pepper marmalade, orange-horseradish gremolata, mangoes, wild Bolognese cherries, chorizo, and corn bread. It's a worldly view of a personal aesthetic, and you never quite know where chef Michael Wagner is going with something until you get a little piece of bliss in your mouth and realize that somehow it works beautifully. Don't miss the Coca-Cola-barbecued beef ribs and the best Key lime pie in Florida. 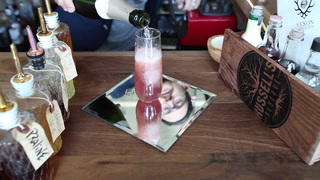 Saketinis and champagne blood-orange cocktails are served at the bar. Prices are moderate in this Hollywood hot spot.